Tax Justice Network: Do corporate taxes destroy growth? Here's some new evidence. 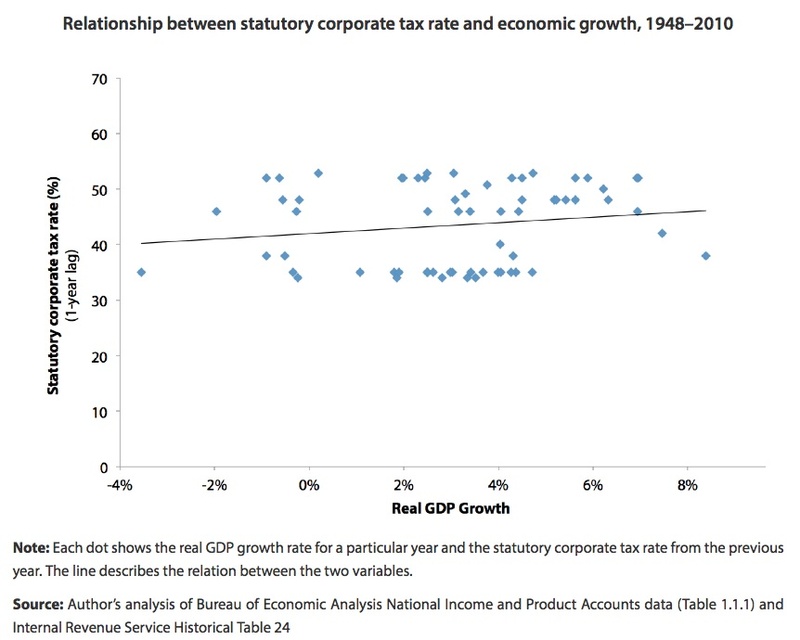 Do corporate taxes destroy growth? Here's some new evidence. Many politicians and accountants and lobbyists and, occasionally, economists, assert that high taxes discourage savings and investment and kill growth. But is this actually true? What does the evidence say? "There is no relation between the share of government revenue and the rate of growth of real output per head. . . It is even quite surprising that such a spread [of the average tax ratio, from 29 percent of GDP in Japan to 55 percent in Sweden] seems to have no effect on economic performance." "it would not be unreasonable to conclude, based on the best available theory and data, that the growth argument has no real basis." Or see this, showing that higher-taxed U.S. states tended to outperform or match lower-taxed states and are better able to weather downturns; or this, on tax 'competition' between states, or this, showing that cutting top tax rates doesn't generate economic growth - although it does increase income inequality. 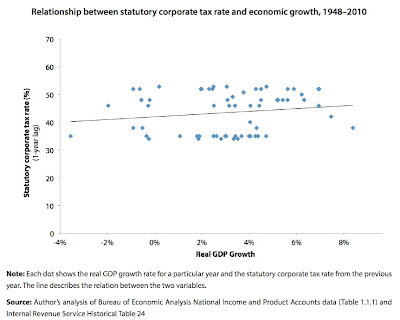 "There appears to be no relationship between capital income taxes and economic growth." The result, it says, applies both to the statutory corporate tax rate, as well as to the effective rate. This study looks at the United States, whereas the FT study cited above looks at a range of countries. Together, these and others studies suggest strongly that while corporate taxes may be useful for tackling inequality and other ills, they aren't useful tools for promoting growth. Which is hardly a surprise, if you think about it. Corporate taxes don't go up in smoke: they are a transfer from one sector to another, and they pay for some of the essential ingredients of growth such as the rule of law, or educated and healthy workforces. And see what candid corporate bosses really think about corporate taxes, here. It makes the tax system more progressive (that is, poorer people pay less as a share of their income.) The study notes that most studies find that the corporate tax burden falls overwhelmingly (75-82 percent) on capital, rather than on workers or others. Although this study focuses heavily on the United States, its implications, and those of the other studies we cite, are wide-ranging. In country after country around the world, the corporation is under attack, both from lobbyists who argue based on flawed evidence that it's a good idea to cut taxes on corporations, and from the disastrous race-to-the bottom on corporate tax rates and corporate tax loopholes - which not only harms the world as a whole, but harms each player in the race who participates. Read more about all that, here.